Sooner or later, all roads lead to the Nam Long Le Shaker, the Vietnamese restaurant and bar that has quietly thrived in a corner of West London for more than 20 years. 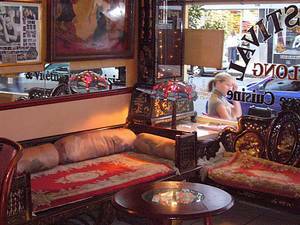 With its Saigon junk shop décor and eccentric owner Thai Dang, it has a back street ambience and rackety allure that’s hard to resist. Diners tired of being royally fleeced by the new glut of bland restaurants serving overcooked chef’s ego and foamed fricassee of baloney could do worse than come here, where the pancake menu pulls no punches and the cocktails could floor an ox. 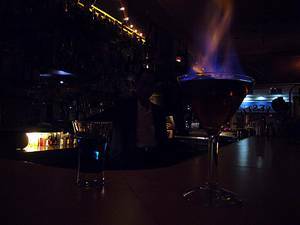 Being too scared (and sensible) to ever try it, I couldn’t recommend the restaurant’s famous Flaming Ferrari cocktail - described on their list as being a ‘powerful jet mixture only suitable for the professional’. The professional what? Perhaps we really don’t want to know the answer to that. The other week, an army officer on leave from a tour of duty in Afghanistan broke the all-time Nam Long record, by downing seven Ferraris in one evening. That says everything you need to know about the horrors of war in Helmand Province. Nothing ever seems to change here and the food has always been on the level of better-than-you-might-expect to surprisingly good. The same chef has worked in the Nam Long kitchen since the joint first opened in 1986, and while you won’t find the kind of echt bowls of pho served in the strictly authentic East London Vietnamese restaurants, there is much to enjoy here. A starter of bo kho, a kind of Viet version of beef jerky, has slivers of dried beef flavoured with five spice, with a delicate burst of liquorice predominating, courtesy of the star anise. Cha gio, one of the house specialties, are rice paper rolls stuffed with chopped vegetables and minced pork, then deep fried. Customers are encouraged to dip the rolls into a bowl of sweet vinegar, roll them up inside a crisp lettuce leaf lined with fresh mint, then eat. Hunks of chicken are threaded on to wooden skewers and grilled on charcoal, then served with a smooth peanut sauce; even the cross-cultural tempura prawn is fresh and good. Notable mains include chien don cay, a dish of crispy shredded beef with a chilli vinegar sauce of which S is devotedly fond. Vegetarians are admirably catered for with a selection of handsome chay (soya bean) dishes, while the pancake menu is great fun and very popular, particularly helpful for a celebrating group ordering cocktails and in need of some nutrition. Pancake choices include charcoal grilled beef with lemongrass; king prawns; sole or duck. Beware, if you no good at drink . . .
Perhaps the best thing of all about the Nam Long is the atmosphere, which is raucous and bustling, with a raffish clientele that has recently included Sienna Miller and the actor Chris Noth, although not together so please don’t quote me on that. Hugh Grant used to be a regular, as did Jeffrey Archer’s son James, who would celebrate successful deals with Flaming Ferraris and his banker colleagues here. With its retro food and Viet clutter, coming here is like stepping back in time through a Hanoi prism, and the menacing Thai Dang sitting on his high wooden throne, abusing customers – ‘American boy! Go away. You no good at drink!’ – or shouting terrifying orders to his waiters somehow only adds to the buzz. From his throne, he uses a tiny but powerful pencil torch to direct staff towards waiting customers; it is rather like a beam of doom. Dang always looks on the verge of dragging members of staff outside to thrash them with a bamboo cane for minor transgressions, but his outward show of belligerence masks a kind heart. Out of his own pocket, he has built a brand new school and a clinic in his hometown back in Vietnam, and he keeps photographs of both establishments in his wallet. Every pancake purchased, every cocktail mixed and every chicken skewered boosts his philanthropy and yours, by tiny proxy. The wine list will send you hurtling on a time warp straight back to when the Nam Long first opened. First off there is the Jacques Vertier house white from Gascogne, a white burgundy from Cave de Buxy (always a reliable co-op), followed quickly by a Sancerre and a Chablis. On both the red and white lists, it seems obligatory to have an Australian or New Zealand choice – the restaurant’s early days coincided with the beginning of the mass market exploration of non-French wines. The list concludes with the curious inclusion of ‘Perrier Sparkling Mineral Water’. Remember when it was so unusual and so posh? What a long time ago that now seems. The Nam Long is popular with American bankers, probably because there are so few proper, gritty cocktail bars in London where they can feel at home. They like it and so do I because it has soul and, in a marketplace crowded with bland imposters, it feels real in a way that so few places do. 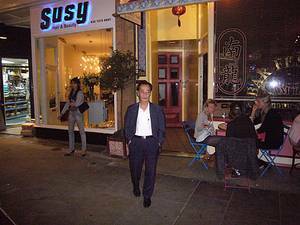 Nam Long Le Shaker, 159 Old Brompton Road, London SW5 0LJ. Tel: 020 7373 1926. Dinner for two, excluding drinks and service, £50. Flaming Ferrari, £15 each.